“Last year, The Journal of the American Medical Association (JAMA) made waves when they released a study that found evidence of chronic traumatic encephalopathy — the degenerative brain disease known better by its acronym CTE, which is believed to be caused by repetitive head trauma — in 110 out of 111 brains it examined of deceased former NFL players. The study garnered big-time headlines — 99 percent is an alarming rate, after all. But it was also the subject of criticism because of its inherent selection bias. 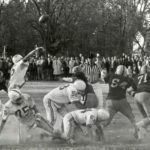 Boston University could only study brains that were donated to its brain bank, and most who donated the brains already had reason to suspect the deceased player suffered from CTE when he was alive. Though it can only be diagnosed posthumously, the symptoms of CTE — ailments such as severe depression, dementia, vertigo, and drastic mood swings — tend to be tragically present at the surface. Last week, Dr. Zachary O. Binney and Dr. Kathleen E. Bachynski published a study that tries to quantify and account for those biases, and provides us with a much better picture of the true prevalence of CTE among NFL players. The news is not good.